LEE CHILD is the author of sixteen Jack Reacher thrillers, including the #1 New York Times bestsellers Worth Dying For, 61 Hours, Gone Tomorrow, Nothing to Lose, and Bad Luck and Trouble. His debut, Killing Floor, won both the Anthony and the Barry awards for Best First Mystery, and The Enemy won both the Barry and the Nero awards for Best Novel. Foreign rights in the Jack Reacher series have sold in more than fifty territories. All titles have been optioned for major motion pictures. Child, a native of England and a former television director, lives in New York City. 2011-03-03. New. Ships with Tracking Number! INTERNATIONAL WORLDWIDE Shipping available. Buy with confidence, excellent customer service! U.S.A: Bantam, 2011. First Edition. Hard Cover. Collectible: Very Good/Very Good. Almost new hardback and jacket. Only slight wear. Text is clean, unmarked. First edition, 1st printing. Full number line: 9 8 7 6 5 4 3 2 1 (Shelf location: BR1) All items carefully packed to avoid damage from moisture and rough handling. Tracking included. 2011-06-03. New. Ships with Tracking Number! INTERNATIONAL WORLDWIDE Shipping available. Buy with confidence, excellent customer service! 2011-04-04. New. Ships with Tracking Number! INTERNATIONAL WORLDWIDE Shipping available. Buy with confidence, excellent customer service! 2016-05-07. New. Ships with Tracking Number! INTERNATIONAL WORLDWIDE Shipping available. Buy with confidence, excellent customer service! 2012-05-09. New. Ships with Tracking Number! INTERNATIONAL WORLDWIDE Shipping available. Buy with confidence, excellent customer service! 2012-03-01. New. Ships with Tracking Number! INTERNATIONAL WORLDWIDE Shipping available. Buy with confidence, excellent customer service! 2012-01-01. New. Ships with Tracking Number! INTERNATIONAL WORLDWIDE Shipping available. Buy with confidence, excellent customer service! 2011-08-02. New. Ships with Tracking Number! INTERNATIONAL WORLDWIDE Shipping available. Buy with confidence, excellent customer service! 2011-09-06. Good. Ships with Tracking Number! INTERNATIONAL WORLDWIDE Shipping available. May not contain Access Codes or Supplements. May be ex-library. Shipping & Handling by region. Buy with confidence, excellent customer service! 2011-01-01. Good. Ships with Tracking Number! INTERNATIONAL WORLDWIDE Shipping available. May not contain Access Codes or Supplements. May be ex-library. Shipping & Handling by region. Buy with confidence, excellent customer service! 2011-02-01. New. Ships with Tracking Number! INTERNATIONAL WORLDWIDE Shipping available. Buy with confidence, excellent customer service! 2012-01-01. Good. Ships with Tracking Number! INTERNATIONAL WORLDWIDE Shipping available. May not contain Access Codes or Supplements. May be ex-library. Shipping & Handling by region. Buy with confidence, excellent customer service! 2012-03-01. Good. Ships with Tracking Number! INTERNATIONAL WORLDWIDE Shipping available. May not contain Access Codes or Supplements. May be ex-library. Shipping & Handling by region. Buy with confidence, excellent customer service! Westminster, MD, U.S.A.: Random House Publishing Group, 2011. Book. Fine. Hardcover. Signed by Author(s). 1st Edition. An Outstanding Copy - Signed By The Author On The Title Page. Signature Only. A First Edition, First Printing. Book Is In Fine Condition. Boards Are Clean, Not Bumped. Fore Edges Are Clean. Interior Is Clean And Legible. Not Remaindered. Dust Jacket Is In Fine Condition. Not Chipped Or Crinkled. Not Price Clipped. Dust Jacket Is Covered By Mylar Brodart. Thanks And Enjoy..
New York: Delacorte Press, 2011. 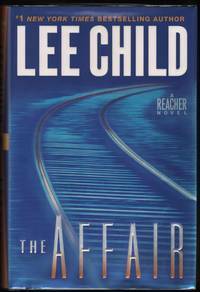 Signed by Lee Child on the Title page. Signature only. A First edition, First printing. Book is in Fine condition. Boards are clean, not bumped. Fore edges are clean. Interior is clean and legible. Not remaindered. Dust Jacket is in Fine condition. Not chipped or crinkled. Not price clipped. Dust Jacket is covered by Mylar Brodart. All-Ways well boxed, All-Ways fast service. Thanks.. Signed by Author. First Edition. Hard Cover. Fine/Fine. Delacorte Press. Hardcover. 0385344325 New Condition *** Right Off the Shelf | Ships within 2 Business Days ~~~ Customer Service Is Our Top Priority! - Thank you for LOOKING :-) . New. 2016-05-07. Good. Ships with Tracking Number! INTERNATIONAL WORLDWIDE Shipping available. May not contain Access Codes or Supplements. May be ex-library. Shipping & Handling by region. Buy with confidence, excellent customer service! New York: Delacorte Press, 2011. SIGNED by the AUTHOR on the Title page. Signature only. A First edition, First printing. Book is in Fine condition. Boards are clean, not bumped. Fore edges are clean. Interior is clean and legible. Not remaindered. Dust Jacket is in Fine condition. Not chipped or crinkled. Not price clipped. Dust Jacket is covered by Mylar Brodart. All-Ways well boxed, All-Ways fast service. Thanks.. Signed by Author. First Edition. Hard Cover. Fine/Fine. New York: Delacorte. 2011. First Edition. Signed by Author Very fine in dust jacket. .
Westminster, MD, U.S.A.: Random House Publishing Group, 2011. Book. Fine. Hardcover. Signed by Author(s). 1st Edition. great copy, minimal wear. NO remainder mark, jacket is not price clipped. first edition stated and complete number line. Publishers Autographed copy sticker on front of jacket, signed on title page. Bantam. Hardcover. 0593065700 New Condition. . New. Random House Large Print. PAPERBACK. 0739378481 New Condition. . New. 2012-05-09. Good. Ships with Tracking Number! INTERNATIONAL WORLDWIDE Shipping available. May not contain Access Codes or Supplements. May be ex-library. Shipping & Handling by region. Buy with confidence, excellent customer service! Delacorte Press. Hardcover. 0385344325 This hardcover book is square and tight. The boards and spine have no wear with pristine gilt. The pages and endpages are clean, with no markings or folds. The dustjacket is As New. Original Price is intact. Not ex-lib. No remainder mark. Signed copy sticker on the front. Signed by the Author on the title page without inscription. . Fine. 2011. First Edition. New York: Delacorte Press, ., 2011. First edition. First edition. Signed and dated in the year of publication by the author. Fine in dust jacket. Everything starts somewhere... For elite military cop Jack Reacher, that somewhere was Carter Crossing, Mississippi, way back in 1997. A lonely railroad track. A crime scene. A coverup. A young woman is dead, and solid evidence points to a soldier at a nearby military base. 2011-03-03. Good. Ships with Tracking Number! INTERNATIONAL WORLDWIDE Shipping available. May not contain Access Codes or Supplements. May be ex-library. Shipping & Handling by region. Buy with confidence, excellent customer service! 2011-02-01. Good. Ships with Tracking Number! INTERNATIONAL WORLDWIDE Shipping available. May not contain Access Codes or Supplements. May be ex-library. Shipping & Handling by region. Buy with confidence, excellent customer service! 2011-06-03. Good. Ships with Tracking Number! INTERNATIONAL WORLDWIDE Shipping available. May not contain Access Codes or Supplements. May be ex-library. Shipping & Handling by region. Buy with confidence, excellent customer service! First Edition. Very good condition. (London) Bantam Press (2011)., 2011. First British printing. 8vo. 427 pp. Original black cloth binding. SIGNED by Child on the title page. This is a tight, fine book in a bright, fine DJ.. Signed by Author(s). 1st Edition. Hardcover. As New/Dust Jacket Included. Random House Audio, 2016. CD-Audio. New. 5.85 x 5.07 cm. Delacorte Press. Hardcover. 0385344325 Please allow 4 - 14 business days for Standard shipping, within the US. Thank you for supporting our small, family-owned business! . New. 2011-09-27. Delacorte Press. Hardcover. 0385344325 Please allow 4 - 14 business days for Standard shipping, within the US. Thank you for supporting our small, family-owned business! . Fine. 2011-09-27. 2011-04-04. Good. Ships with Tracking Number! INTERNATIONAL WORLDWIDE Shipping available. May not contain Access Codes or Supplements. May be ex-library. Shipping & Handling by region. Buy with confidence, excellent customer service! New York: Delcorte Press/Seymour Lawrence, 2011. Book. Fine. Hardcover. Signed by Author(s). First Edition/First Printing. A square solid tight clean as new copy. This copy also includes a picture of Lee at the signing event. THIS COPY IS IN MY POSSESSION AND NORMALLY SHIPS NEXT DAY..
2011-08-02. Good. Ships with Tracking Number! INTERNATIONAL WORLDWIDE Shipping available. May not contain Access Codes or Supplements. May be ex-library. Shipping & Handling by region. Buy with confidence, excellent customer service! Dell. Mass Market Paperback. 044024630X Please allow 4 - 14 business days for Standard shipping, within the US. Thank you for supporting our small, family-owned business! . New. 2012-03-27. Reprint. Dell. Mass Market Paperback. 044024630X Please allow 4 - 14 business days for Standard shipping, within the US. Thank you for supporting our small, family-owned business! . Fine. 2012-03-27. Reprint. Bantam. Hardcover. 0593065700 Like New Condition. . Fine. Random House Large Print. PAPERBACK. 0739378481 Like New Condition. . Fine. New York: Delacorte, 2011. 1st. Hardcover. Fine/fine. Bound in publisher's original blue cloth, spine lettered in gilt. Delacorte Press. Used - Good. Former Library book. Shows some signs of wear, and may have some markings on the inside. London: Bantam. Hardcover. 0593065700 . New. 2011. 1st UK Edition.